With Strong Operational discipline we shall strive to continuously improve- processes and the Quality Management Systems to deliver reliable, cost- effective, and environment friendly home appliances to delight consumers and be their first choice. We at Carrier Midea India consider quality assurance to be of utmost priority and undertake stringent measures to ensure this. Our factory is ISO certified ISO 9001:2015 certification by TUV SUD. We have assembled a Part Reliability set up to ensure thorough material testing. This includes testing related to the mechanical, electrical, and PCB divisions. We have created the Product Reliability set up as an important part of the product testing process, which includes both, Early Life Test & Product Life Testing. We have set up state-of- the-art Helium Leak Detection (HLD) devices all throughout the factory to detect any Helium gas leakage. Unlike traditional HLD processes that are seen elsewhere, these devices are cutting edge with more sensitivity and accuracy. The Heat Exchanger in the air conditioner sealed system is the most critical part of the set up. An in-house Coil/Heat Exchanger & Copper Tubing Manufacturing set has been put into place to ensure quality 24/7. We have put together a dedicated team for in-house product development and ensure the highest level of efficiency. The set also consists of a skilled team that operates from efficient testing facilities. 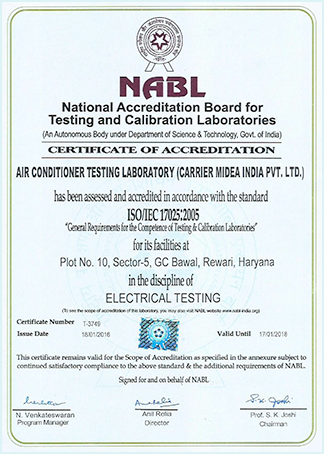 National Accreditation Board for Testing and Calibration Laboratories (NABL) has accredited Carrier Midea India’s R&D Laboratory for air conditioners. Carrier Midea India Pvt. Ltd. installed a 5HP laboratory at its factory premises in 2013 and maintained it at par with the international standards of Midea's global laboratories. In 2015 it was decided to upgrade it to the NABL level. The NABL accreditation ensures that the test results are absolutely accurate and facilitate creation of best in-class products. NABL accredit recognition of the technical competence of a testing, calibration or medical laboratory for a specific task following ISO/IEC 17025:2005, ISO 15189:2007 Standards. The NABL accreditation is recognised in 200 countries and is a benchmark synonymous with world-class quality. This accreditation serves as proof that only a reliable and well-qualified product goes out from the Carrier Midea India factory to the customer.